Finding a great pair of basketball shoes as a big man is not as easy as it used to be. 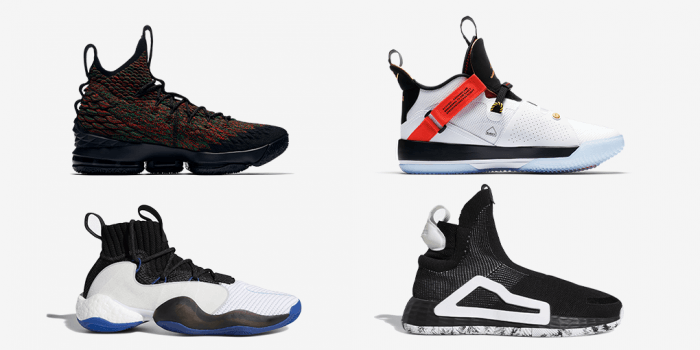 The NBA game is shifting away from slow and heavy big guys, towards smaller and more versatile players, and the same is happening to basketball sneakers. 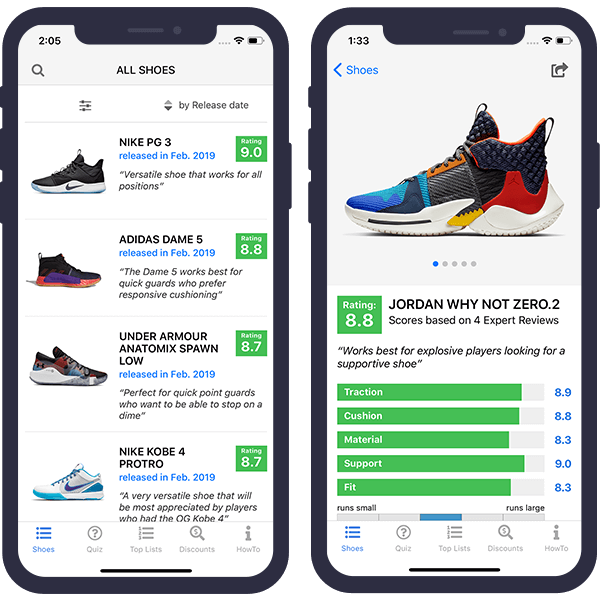 Signature shoes these days are almost exclusively reserved for guards like Kyrie Irving, Paul George or James Harden and the only taller guy that has a signature sneaker with one of the big brands is Kevin Durant – not exactly a traditional center! But fortunately, there are still some sneakers that work well for traditional big guys, and in this article, I am going to show you how to find them! Traditionally, basketball sneakers were cut higher than regular sneakers, ending above the ankles. While that is no longer a case, with light and flexible low-tops becoming more and more popular, most big guys still prefer high-tops. These shoes provide additional support and a sense of security which is important for the battle under the basket. ​The ankle collar also helps to protect against other players stepping on your feet, and the additional weight doesn’t matter for most big guys because they don’t rely on their quickness anyways. 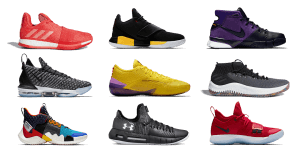 Guards like Steph Curry or Kyrie Irving don’t need a lot of cushioning, and this shows in their signature sneakers which come with very firm and low mid-soles. Obviously, that won’t work for heavier basketball players! The additional pounds of big guys put a lot more stress on the joints and which means they need softer and more comfortable shoes to reduce the amount of pressure they put on their feet. Cushioning systems like Nike’s Zoom or Adidas’s Boost, which offer a lot of impact protection and comfort, are are a great choice for centers. 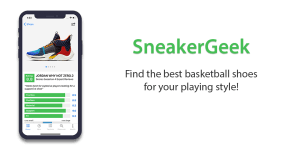 You can check out all shoe reviews and apply your filters as you like here. 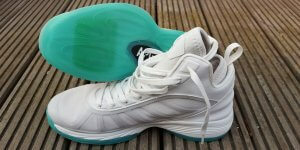 Very supportive leather upper, great traction, and responsive Zoom Air cushioning. Works extremely well for big guys that need a lot of impact protection. Perfect for players with narrow feet who like to ball outdoors. 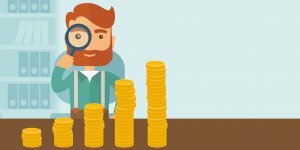 We check current prices and discounts every day to find the best deals for you. Last updated on 18th April 2019. Apply discount codes at checkout. 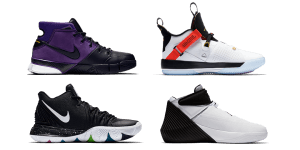 Find basketball shoes that fit your playing style and stay up-to-date with all the latest releases! The performance retro of the original Kobe 1 Protro turns out to be very divisive. Some reviewers love the retro materials and sturdy feel of an old-school basketball sneaker, while others complain that these are too heavy and bulky compared to current performance sneakers. Traction and cushioning perform very well and the support is absolutely amazing because of the solid materials used. The fit is more problematic as the leather doesn't conform to your feet as well as modern textile materials do. If you like old-school basketball sneakers then you will love the Kobe 1 Protro, but if you are looking for a minimal and fast shoe then this isn't for you. The Adidas Boost You Wear (BYW) X is a modern performance-basketball version of the old Adidas Feet You Wear line. The herringbone traction pattern performs very well out-of-the-box, but starts to fray and pick up dust quickly. Some reviewers didn't like the decoupled feeling of the forefoot and heel: The uncaged Boost cushioning in the heel is very soft and comfortable, but the forefoot is much firmer and responsive because the Boost is completely caged here. Materials are premium and comfortable and support is surprisingly solid. Overall, the opinions on the Adidas BYW X are split, some reviewers feel like they are Adidas' best performance basketball shoes, other feel they are flawed and overpriced.